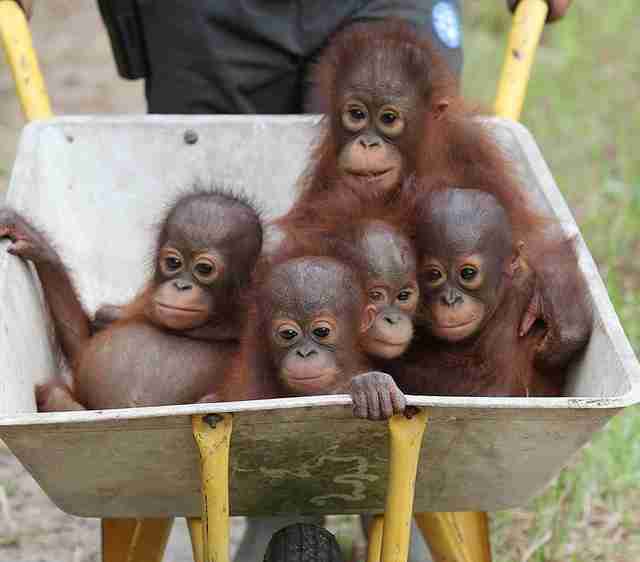 What could be sweeter than a wheelbarrow full of excited young orangutans heading off to play in the forest? Perhaps the fact that it was made possible thanks to people like you who donated to keep the little ones happy. Life is abustle with activity at an orphaned orangutan rehabilitation center run by International Animal Rescue (IAR) in Indonesia. There, some 80 playful orange primates awaken each morning eager to begin their day learning about life in the surrounding forests. 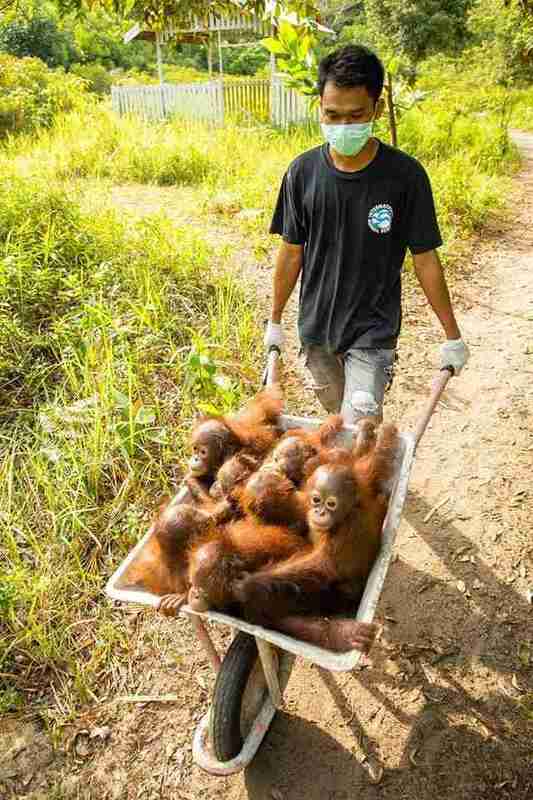 "The babies go to our Baby School, and for the slightly older ones, Forest School," Lis Keys from IAR told The Dodo. "There's a lovely big climbing frame and lots of food, and the babysitters stay with them to encourage the small ones to learn to climb and to get the hang of being an orangutan." 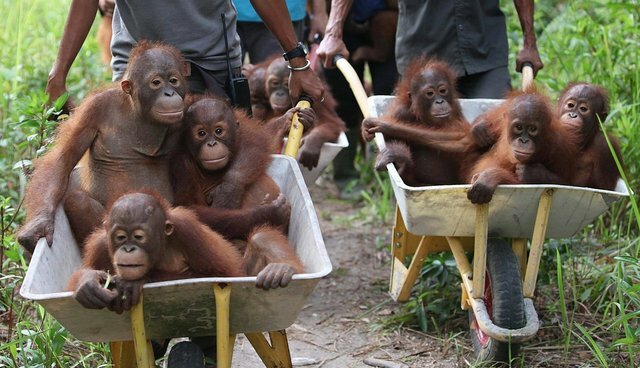 Getting the group of rambunctious youngsters to and from the forest would be a far more time-consuming chore if it weren't for a special fleet of wheelbarrows, all of which were paid for with donations. "This is the most practical solution for transporting them. It's like a little school bus," said Key. 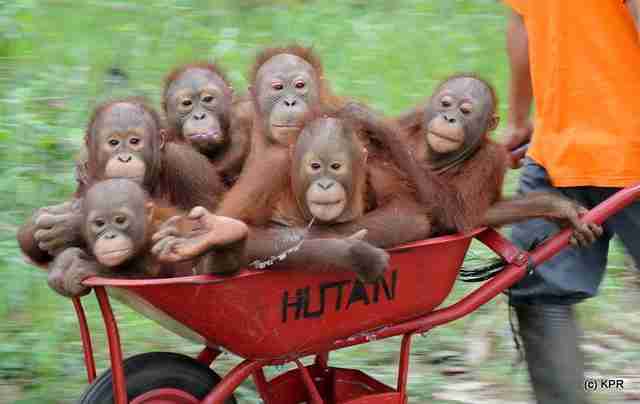 "Without the wheelbarrows, our volunteer babysitters would have to carry each one. 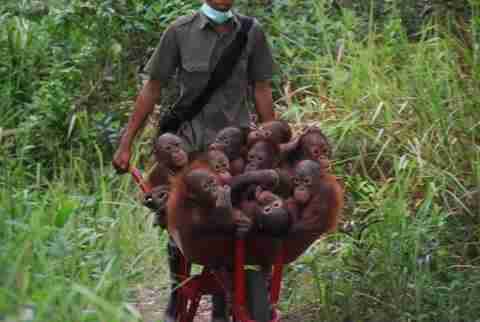 It's quite hard to take two, three or more young orangutans out to the forest, but this way we can pile them together, and they seem to really quite enjoy it." While it's easy to see the orangutans enjoy their daily trips with their kindhearted sitters, things weren't always so peaceful for them. Each of the center's littlest residents were rescued from saddening situations, having been kidnapped and sold as pets, or left orphaned by the death of their parents. Every year, an estimated 1,500 to 5,000 orangutans are killed, victims of habitat loss from palm oil plantations or bloody conflicts with humans, who often kill adults so they can sell their babies into the pet trade. "It's also incredibly poignant to see these babies, but they really shouldn't be seeking comfort from a babysitter. They should still be with their mothers, protecting them and looking after them," said Key. "But they're at the early stages of a very long process which will end, we hope, with their return to protected forests to, once again, be wild orangutans." Volunteers at the center take great care not only to provide enrichment and comfort to the happy group of youngsters, but also to minimize the unseen dangers of being around humans. Orangutans are susceptible to human illness, so sitters wear face masks to make sure they don't get sick. International Animal Rescue's orangutan center relies entirely on funding from donations to keep up with the growing number of orphans under their care - and with the support of people across the globe, they're able to provide these animals with a brighter future. "Each orangutan has a long road before going back into the wild, and obviously it's very costly, so we're just delighted that people seem to love these little orangutans," Key said. To help toward the cost of a new wheelbarrow and the center's operations, you can donate here.